Initially scheduled for launch back in 2010, China has finally launched the long-awaited Hard X-ray Modulation Telescope (HXMT) using a Long March-4B (Chang Zheng-4) launch vehicle from the Jiuquan Satellite Launch Center. Launch took place at 03:00 UTC from the 603 Launch Pad of the LC43 Launch Complex. The new orbiting telescope will be used to monitor pulsars and other objects that could help unravel the mystery of their energy sources. 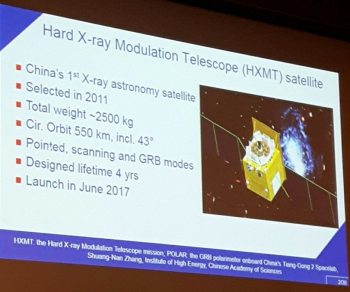 Compared with previous X-ray astronomical satellites, HXMT has a larger detection area, broader energy range and wider field of view. These gives it advantages in observing black holes and neutron stars emitting bright X-rays, and it can more efficiently scan the galaxy. The Hard X-ray Modulation Telescope was initially proposed by IHEP (Institute of High Energy Physics of the Chinese Academy of Sciences) scientists Li Tibei and Wu Mei based on their innovative direct demodulation image reconstruction method. The main scientific objectives of HXMT are to scan the galactic plane to find new transient sources, to monitor the known variable sources, and to observe X-ray binaries to study the dynamics and emission mechanism in strong gravitational or magnetic fields. There are three main payloads onboard HXMT, the high energy X-ray telescope (20-250 keV, 5100 cm2), the medium energy X-ray telescope (5-30 keV, 952 cm2), and the low energy X-ray telescope (1-15 keV, 384 cm2). All these three telescopes are collimated instruments. Using the direct demodulation method and scanning observations, HXMT can obtain X-ray images with high spatial resolution, while the large detection areas of these telescopes also allow pointed observations with high statistics and high signal to noise ratio. It is expected that HXMT will discover a large number of new transient X-ray sources and will study the temporal and spectral properties of accreting black hole and neutron star systems in more details than the previous X-ray missions. The payload module of the HXMT was developed by IHEP and Tsinghua University, while the satellite bus was developed by the Chinese Academy of Space Technology (CAST) based on the Ziyuan-2 / Phoenix-Eye-2 satellite bus. Launch mass of HXMT is 2,800 kg and its dimensions are 2.0 by 2.0 by 2.8 meters. 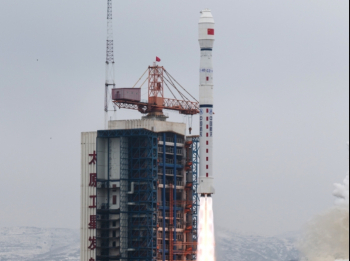 With a launch mass of 50 kg each, the Zhuhai-1 earth observation satellites are the video component of the Chinese Orbita Earth observation system. Two OVS-1 (OVS-1a and OVS-1b) satellites constitute the prototype OVS-1 video component. The operational Orbita constellation is to consist of video satellites (OVS-2), hyperspectral satellites (OHS-2) and small personal satellites (OPS 2). 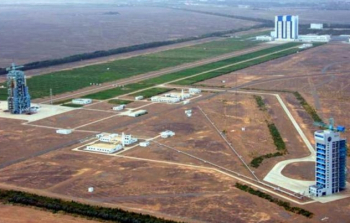 The additional payload on this launch is composed by the Argentinian ÑuSat-3 “Milanesat” satellite that is the third satellite in the Aleph-1 constellation developed and operated by Satellogic S.A.. The Aleph-1 constellation will consist of up to 25 satellites. The satellite has mass of 37 kg, with dimensions 450mm x 450mm x 800mm. The primary objective of the mission is to commercially provide Earth observation images to the general public, in the visible and infrared parts of the spectrum. The satellite is equipped with cameras operating in visible light and infrared, and will operate in 500 km SSO orbit with inclination at 97.5°. ÑuSat-4 and ÑuSat-5 will be launched in August 2017. The feasibility study of the Chang Zheng-4 began in 1982 based on the FB-1 Feng Bao-1 launch vehicle. Engineering development was initiated in the following year. Initially, the Chang Zheng-4 served as a back-up launch vehicle for Chang Zheng-3 to launch China’s communications satellites.